We are proud to announce our new Stainless Steel Stencils for protoype SMD surface mount work. We have partnered with a US based stencil manufacturer to provide a pooled/batch stencil service. 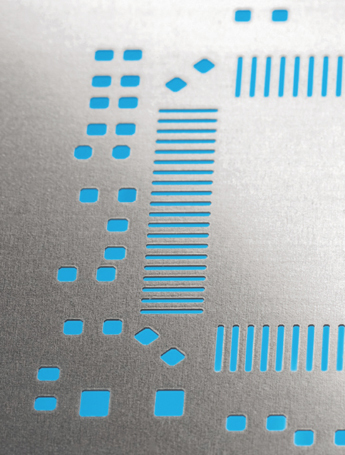 By pooling small batches of orders onto our pre-purchased panels we can provide you with the highest quality stencils at a fraction of the price of our competitors. We will continue to offer our high quality and quick turn Kapton Stencils, but intend to provide our excellent customer base an additional option for larger prototype and small production runs. We are providing stainless steel stencils up to 11″ x 11″ x .004″ in size that are to be used in the production of prototype and short run printed circuit board designs with surface mount components. All stencils will be a minimum size of 4″x4″ and will have a 1″ border surrounding all SMT pads or the pcb outline of your board if it is provided. Pricing for our stainless stencils will be based upon the individual area of each pcb design. This service will utilize state of the art Tannlin laser systems to produce the highest quality stencils in a timely and price conscious manner. You can see a video of the amazing capability of this machine in the video below.